Having a diagnosis of cancer can be very frightening. But “cancer” is only a word… not a sentence. 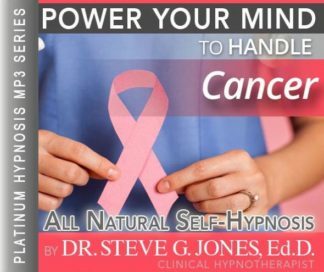 This Handle Cancer Hypnosis MP3 is for individuals who want “support” as they use chemotherapy (and other therapies) to treat cancer. Hypnotic suggestions are directed to strengthen the immune system, to alleviate anxiety and discomfort, and to develop a stronger ego in maintaining a positive outlook, attitude and expectation toward healing and recovery. Positive ideas, affirmations, images, and outlook are supported by hypnotic suggestions offered to the conscious & unconscious mind, and spirit. This Handle Cancer Hypnosis MP3 audio promotes a positive outlook while effectively using chemotherapy and/or radiation when treating the condition of cancer. Hypnotic suggestions focus on healing, comfort, protecting healthy cells/tissues while targeting the cancer cells for the chemotherapy or radiotherapy, boosting the immune system, and enhancing confidence and the power of belief. Scientists do not know if hypnosis might affect cancer cells, your immune system, or the disease of cancer in any way. Hypnosis is not a medical treatment for cancer, but there may be an important role for hypnosis in managing cancer. Hypnosis has been effective in helping patients reduce pain, stress, and depression, and calm fears and anxiety. Teaching a patient the use of self-hypnosis to control symptoms or side effects can powerfully impact them by providing them with a sense of mastery to help counter feelings of helplessness and powerlessness. § Deep meditative hypnosis produces feelings of calm and tranquility that fosters the immune system’s ability to function at a maximum level, aiding the body’s ability to protect and defend itself against disease. § The side effects of nausea, vomiting, diarrhea, loss of appetite and loss of hair may be successfully addressed through hypnotic suggestion according to both scientific research and anecdotal experience. § Helping an individual tap into and use their inner resources and strengths fosters feelings of self-empowerment to deal more effectively with the circumstances of their lives. Hypnosis is not a cure-all. It is a powerful tool that helps us more effectively use the wonderful mind we have been given. Recognizing that our beliefs color and shape our experiences, one can use this hypnotherapy mp3 to work with the subconscious mind to “re-educate” or “replace” that belief, which is no longer serving us well, with a greater idea. The uses and benefits of using my hypnotherapy MP3 on a regular basis are many and wonderful. It can help you live more effectively, more productively and, yes, even more joyfully. Steve G. Jones, Ed.D., Clinical Hypnotherapist, charges $1,500 for a custom recording and $25,000 for a one-hour private hypnotherapy session at his office. but you can get all the benefits for this low price. Simply listen to the Handle Cancer Hypnosis MP3 download every night as you go to bed for three weeks and feel the changes happening in your life. You will feel more empowered, more in touch with your true self, and you will truly know that your goals are within your reach. And as you continue relaxing deeper, deeper, and more deeply relaxed I would like you to really get in touch with your body, your entire body. And realize that you are in charge of your body, you are in control of your body. You are in control of your emotions. You are in charge of all the physiological processes in your body and you are in charge of the spiritual aspects of your body. There is an energy that flows through your body and allows you to relax. Allows you to cleanse and heal yourself and this energy works on all three levels, the emotional level, the physiological level and the spiritual level. And you are in charge of all three of these levels. I would like you now to imagine that healing energy, that multi-faceted healing energy moving through your body, radiating out from your chest area, from your heart, radiating all over your body, that’s right. Feel yourself healing emotionally, feel yourself physically stronger. Feel all of the organs in your body functioning at their optimum level and feel a sense of spiritual peace spreading all throughout your body as all three of these healing energies spread through out your body, cleansing it, healing it, relaxing your body. Day by day these three energies will become more and more powerful in your body and in your mind and you begin to think more positive thoughts about yourself and your possibilities. Day by day your thoughts become more and more positive. You allow yourself to relax more and more. And your outlook on life is becoming more positive. You are a very positive person. You are a very relaxed person. You are a very confident person. I would like you now to imagine yourself one year from today, very relaxed, very healthy, full of vital energy. See how happy you are. Now, I’d like you to imagine yourself five years from now looking even more healthy, even more relaxed, even more confident. You are the picture of health, physical health, mental health, and spiritual health. You look and feel wonderful. You are so very alive and imagine yourself now ten years from the future. See how happy and relaxed you are. See how positive your outlook is. Imagine yourself looking back at those ten years and smiling and remembering how purchaseive they were. Now imagine yourself twenty years from now and continue picturing yourself further and further in the future, happy, content, calm, healthy. As you now continue to relax I want you now to breathe in deeply and as you do imagine yourself breathing in healing energy. And as you slowly exhale now, let go of any negative feelings. Let go of any doubt, let it go. And breathe in healing powerful, cleansing energy, that’s right, breathe it in and hold it. As you exhale, let go of any negative energy, let it go. I’d like you now to take a few more breaths like this and as you do, just allow yourself to relax more deeply with each breath, to become more positive, to let go of all negativity, let it go, let it go. And you realize that everything is going to be just fine. You are healthy. Unfortunately, there is not a cure for cancer. But through traditional, modern, and alternative medicine there are ways to heal cancer. With a diagnosis of cancer, you probably want to make sure you are doing everything possible to rid your body of the cancer cells. Your mind is very powerful and everyone can agree that we do not know the true ability that our mind holds. The efficacy of hypnosis has been tested and found to be very beneficial towards healing and pain management. Healing your cancer is not an easy process, but we believe that the Handle Cancer Hypnosis MP3 session will help you ease the burden of your cancer. At this time in your life, you need all the emotional, physical, and spiritual support you can get. Studies have shown that hypnosis helps people heal. This powerful program will help you heal cancer. You deserve to live a happy and healthy life. Hypnotherapy will help you both mentally and physically. This program works by targeting your subconscious mind. Your subconscious mind will tell your body to heal and permanently remove your cancerous cells. This powerful program will give you the relaxation time you need. You will be able to focus on your cancer in a natural and safe way. This program will help you target your cancer cells and help them heal and become normal and healthy cells. Your subconscious mind is powerful and can tell your body to heal. Studies have shown that hypnosis is effective in improving the quality of life for terminally ill cancer patients. A study in England comprised fifty terminally ill cancer patients divided into two groups. Both groups received the standard pharmaceuticals administered to terminal cancer patients, but one group also participated in weekly hypnosis sessions. This study found that the group of patients who participated in hypnosis reported a substantially higher quality of life, including lowered depression and anxiety, than the group that was treated with pharmaceuticals alone (Liossi, C. & White, P., 2006). Liossi, C., & White, P. (2006). Efficacy of clinical hypnosis in the enhancement of quality of life of terminally ill cancer patients. Contemporary Hypnosis, 18(3), 145-160.